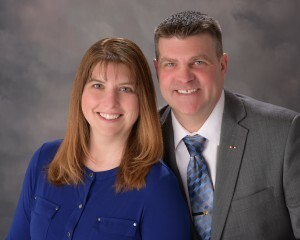 Berkshire Hathaway HomeServices Snyder & Company, Realtors® has announced the addition of Clint and Julia Feldkamp to their team. Clint Feldkamp is a consummate salesman and is passionate about the needs and goals of his clients. He specializes in bringing peace of mind to home sellers who have previously struggled with selling their homes on their own or with another agent. Clint made the leap to real estate after serving his country for 21 years in the U.S. Navy and has had extensive sales and marketing experience during his career, enabling him to be an extremely effective and efficient agent. Clint’s enthusiasm and professionalism matched with his exceptionally well rounded sales, marketing, and communication acumen makes him a very sought after agent for buyers and sellers alike. Julia Feldkamp is a Realtor with a passion for finding the right home for you! Her background as a business manager for a home inspection company gives her the edge in seeing the scope of the house. Julia is also an accomplished musician and music educator, recently as a trombonist with the Ypsilanti Symphony Orchestra. Julia and her husband, Clint, live in the Saline area with their six children.